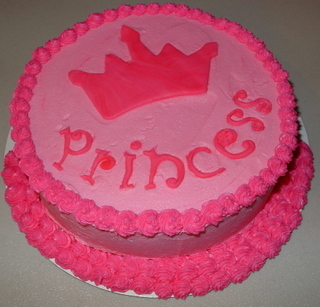 Planning the perfect princess cake for your party can be lots of fun. I have always enjoyed making the cakes for my children's birthday parties. Often, however, I need a good idea before I can get started. Did you make an amazing princess-themed cake? Share it with our readers. Submit photos here. You will find several cake ideas here, with details on how to make each one. Do not be intimidated if you do not have very much experience decorating cakes. Many of the cakes you will see can be made with just a few basic cake decorating techniques. Be sure the share your cake photo so we can all be inspired for our next princess party. Take a look at our gallery cakes. Click on any image to learn how to make the cake. A simple carriage cake decorated with a star tip is easy, but can be personalized with color and decoration. A Wilton carriage cake pan makes this cake easy to make for any princess birthday party. 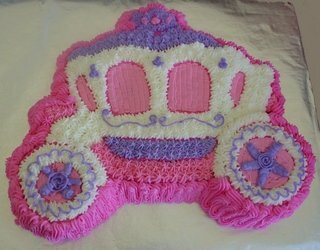 Click on the picture above to learn how to make this princess carriage cake. Another very simple cake decorated with fondant cut out with cookie cutters. Fondant can make any simple cake into a fun cake. All you need are some fun princess cookie cutters and fondant or modeling chocolate. 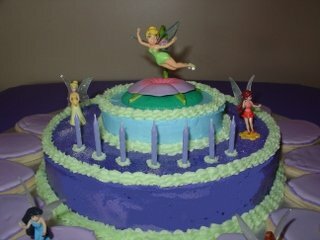 Tinker Bell cake toppers can bring the feel of Pixie Hollow to any cake. Use these toppers on a round cake with oval cookies for petals to create the look of fairies flying in a flower. Click on the picture above for directions to make this cake. This is another easy cake decorated with a star tip. 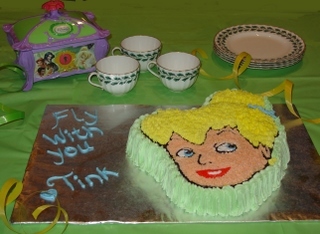 A Wilton Tinker Bell cake pan makes this cake creation a breeze to create. Click on the picture above for directions to make this cake.